Discover the Japanese secret to longevity and cardiovascular health! The Japanese live longer and healthier than most other people on earth. According to the World Health Organization, not only can Japanese women and men expect to live 86 and 79 years respectively (compared to 80 and 75 years for Americans), but they can also anticipate an average of 75 years of healthy living. One of the reasons are they eat a diet high in fish, vegetables, rice and fermented soy products. As a result, they have a very low incidence of cardiovascular disease. They also eat natto, a cheese-like product from fermented soybeans. According to Japanese folklore, ancient Samurai warriors consumed natto on a daily basis, and also fed it to their horses to increase agility, power and speed. Natto has been used for more than a thousand years in Japan as a folk remedy for fatigue, dysentery, heart and vascular diseases. It is still very popular in Japan where the annual consumption is approximately four and a half pounds per person. Since most Americans find natto’s smell and taste repulsive, it’s best to take nattokinase in a dietary supplement. An 8-week, randomized double-blind study examined the effects of nattokinase supplementation on 86 untreated adults with high blood pressure. The participants ranged from 20 to 80 years old, and had a systolic blood pressure of 130 to 159. Systolic pressure is the number on top, (i.e. 120/80) which measures the pressure inside your blood vessels at the moment your heart beats. 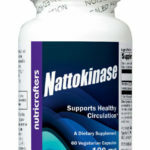 “Nattokinase, the “Japanese wonder” gets your blood pumping.”Townsend Letter for Doctors and Patients. 2005. HighBeam Research. (December 17, 2009). Kim JY, Gum SN, Paik JK, Lim HH, Kim KC, Ogasawara K, Inoue K, Park S, Jang Y, Lee JH. Effects of nattokinase on blood pressure: a randomized, controlled trial. Hypertens Res. 2008 Aug;31(8):1583-8.